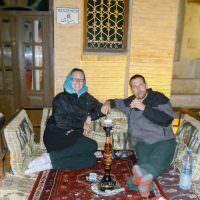 After a crazy few days in Kerman, we headed for Shiraz, the cultural and artistic capital of Iran. Because of the ceremonies for Ashura, buses were not running for 3 days, so we had to hire a taxi to take us. In most countries, a 9 hour taxi ride with 2 stops along the way would be way out of our price range, but seeing as the ride cost only $60, we decided to take it instead of waiting for the bus. Our taxi driver was a quiet, gloomy fellow (very unusual in Iran), but he took us to where we wanted to go. First we stopped at a cave village called Meymand, similar to Cappadocia in Turkey, which has been continuously inhabited for at least 3000 years! 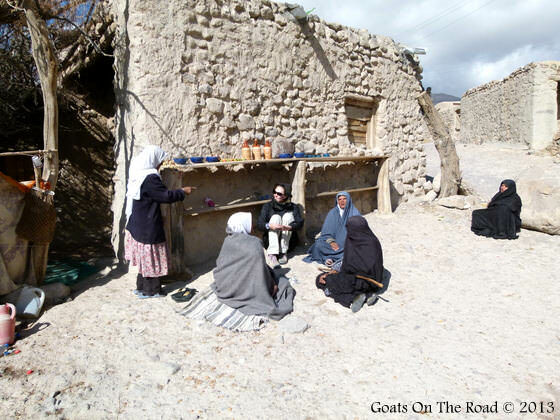 The cave dwelling locals looked at us curiously as we inspected their beautiful rock homes. No tourists around meant hardly any curio shops, which meant that the place still felt rather authentic. After Meymand we hopped back in the car for another 4 hours before arriving at Persepolis, Iran’s main tourist attraction. 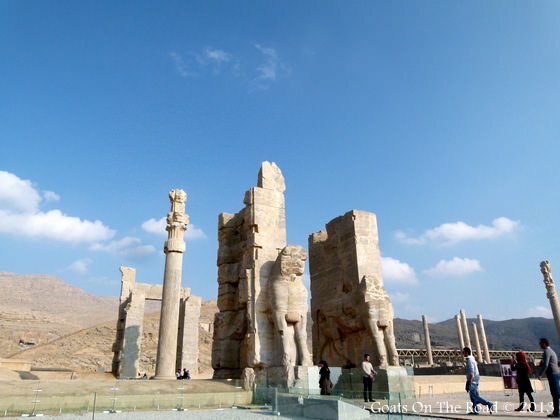 The city of Persepolis was built by Darius I, then added to by King Xerxes I and II and Artaxerxes I, II & III. Construction started around 520 B.C., but somehow its intricate stone carvings and towering columns have survived the centuries. 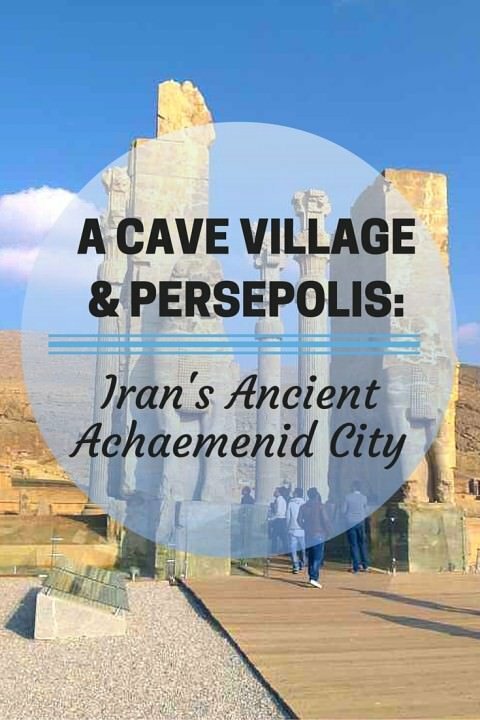 We wandered around the city and could almost hear the trumpets blasting, and the bustle of the ancient palace that was Persepolis in its former glory. 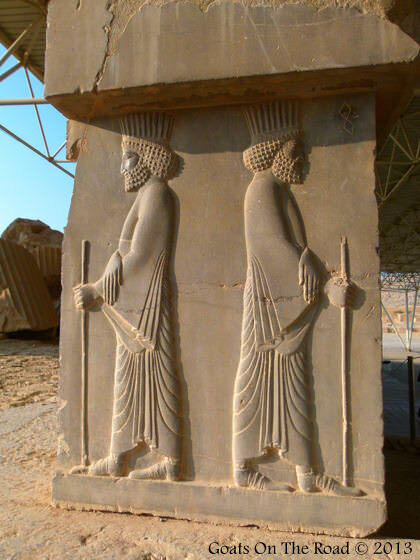 Some of the carvings at Persepolis were still so perfectly preserved that they had a buffed shine to them. The Apadana Staircase portrayed scenes of delegates and kings being welcomed to the palace from all of the four corners of earth. The artistic imagery helped us to imagine how opulent and important this place once was, while the impeccable detail only added to the illustration in our minds. The massive site is now left in ruin, but because there are parts that have survived so well, you can get a good feel for how amazing this city once was. We followed the map from our guidebook (which was poor as usual) and before long we were just enjoying getting lost in the complex. We headed up the mountain to the tombs of Artaxerxes II & III which were unimpressive compared to the city itself, but they granted us amazing views over Persepolis. From this high vantage point we could see just how huge the place was. We could see the 100 columns that make up the main palace, as well as a treasury which was once loaded with gold and jewels. It is said that when Alexander The Great conquered the city around 331 B.C, he had to order 3000 camels just to haul off his loot from the treasury. 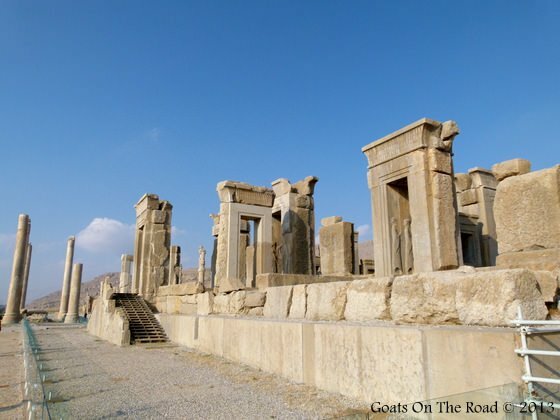 We’ve seen some amazing sites in the world, but Persepolis is among the top of the lot. With such stunning and detailed carvings, coupled with its towering palace walls and leaning columns, it will be a site we will never forget. People have been telling us that they are tired of seeing ancient monuments but for us, they never get old. To stand before a palace like Persepolis and gaze in awe at what civilizations must have been like over 2 millenia ago is a real privilege, and we felt very honoured to be there. What’s Your Favourite Ancient Site? Have You Ever Seen So Many That You Got Tired Of Them? Tell Us Below. 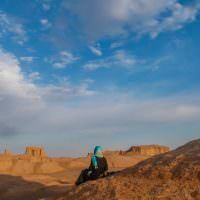 Tabriz & Tehran: The End Of Our Epic Adventure! Great pictures guys, when I have visited earlier that year It was on sunset so majority of my pictures just play of the light! Great! That is really quite amazing that those carvings are 2500 years old; looks like they were made yesterday! I know, right?! They were in the best condition. Cool journey, don’t forget to help me collect some foreign money , i collected many currency. Hi Jenni 🙂 We don’t mind at all, thanks for sharing!